Many Oregonians flock to the Coast for July 4. The cool breezes are a welcome respite from the Valley’s summer heat, and there are so many things to do! People and pets will be playing on the beaches, where wildlife can be overwhelmed by the disturbance. What is fun and relaxing to us can be very nerve-wracking to wildlife, and can even cause the loss of young babies and nests. 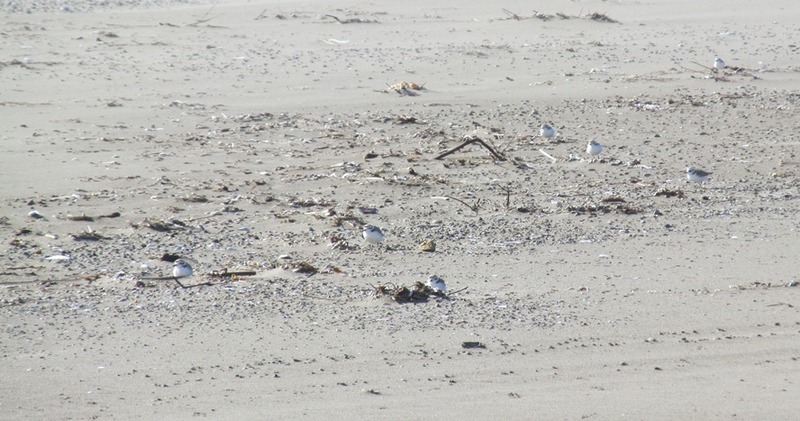 Each year on our sandy beaches, imperiled western snowy plovers settle down to nest. Federally and state threatened, plovers have been forced into smaller and smaller areas as their habitat has been consumed by invasive plants and development. With no where else to go, the birds try to raise their young on the beach that is left – which is also where people go to play. Since plovers and their nests are well camouflaged, beach visitors often don’t even know they are there! How many plovers do you see? But the birds certainly know people are there. When an adult flushes away from its nest to avoid people and pets, the nest and young are vulnerable to predators and weather. A tiny shorebird nest can get covered in sand very quickly with our Coast “breezes”! Keep in mind that infrequent disturbance short in duration isn’t the problem – it becomes a problem when people are always walking by (different people! ), or sitting down near a nest. Each nest is critical to the survival of these birds, and thanks to Oregonians their population is on the rise! Some preserved areas serve as nesting grounds and affords these birds a chance at successful nesting, which is helping their populations to rebound. This holiday, the main concerns are the large crowds and the use of fireworks. Fireworks and nesting birds do not mix; to a shorebird, fireworks are loud, startling noises rather similar to gun shots. Adults can panic, and leave nests and flightless chicks without protection. In order to help us protect these birds we ask that you not shoot fireworks into the nesting areas or on beaches (where it is illegal whether birds are there or not), keep your dogs on a leash and out of the nesting areas (where they aren’t allowed anyway), and do not cross any rope barriers that are established to protect nesting birds. There has been a large time investment by beach goers, OPRD staff, and many other agencies ensuring the success of this year ‘s flock of fledglings and we need your help for that success to continue. RESPECT POSTED AREAS– Nests are hard to see! They are well camouflaged and blend in with the sand. Walking or allowing your dog to roam in roped off areas puts nests at risk of being trampled or abandoned by their parents. Shooting fireworks, flying remote controlled planes, or flying a parasail adjacent to or within protected areas creates a disturbance and will chase birds away. NEVER INTENTIONALLY FORCE BIRDS TO FLY– Birds come to our beaches to rest just like we do. When we scatter a group of birds they have to use energy that they need to reserve for nesting activities or migration. While it creates a great visual it is the same as someone chasing you as soon as you sit down on the beach. KEEP PETS ON A LEASH AND AWAY FROM NESTING AREAS– While your dog might not chase birds, nesting shorebirds can’t distinguish a good dog from a predatory dog, or a leashed dog from an unleashed one. They assume all canines are predatory and react as such, flushing off of their nest when approached by anything resembling a threat; this includes your dog no matter how well behaved. KEEP THE BEACH CLEAN AND DO NOT FEED WILDLIFE– Food scraps attract predators such as crows and ravens to the beaches. It is against the rules to feed wildlife on the Ocean Shore not to mention it is impolite to your beach neighbors to attract gulls with snacks. They will eat anything and don’t know when to go away. It’s funny in “Finding Nemo”, but not so great when they are staring at you! That’s it! Pretty straight forward, and so easy to do. Please go and enjoy our beautiful coast, and share the beach with the wonderful wildlife!